Micky Dolenz is, of course, most well-known as a member of The Monkees, the band formed for the television show of the same name. The show launched in 1966 and became a fast success, with the likenesses of the band appearing on t-shirts, lunch boxes, and indeed comic books. Dell produced a comic titled The Monkees beginning in 1967, featuring a music-less version of the characters in many of the same type of antics. Jose Delbo provided most of the interior art for the series, with the covers all using (mostly pre-existing promotional) photos of the band. The video from last year's "She Makes Me Laugh" uses images from the series. That was not the first time Mickey Dolenz had been drawn into a comic book! Dolenz had actually been a child actor with a decent career well before The Monkees. His first big role was a full decade earlier in an NBC show called Circus Boy. Dolenz played an orphan named Corky who was a water boy for the Burke and Walsh Circus in the late 1890s. Most of the show's plots revolved around ensuring the circus was successful enough to continue as it traveled from town to town. The show itself was successful enough to run for two seasons, which was more than enough for Dell to license it and run it through their Four Color series. Issues #759 (December 1956), #785 (April 1957) and #813 (July 1957) are all Circus Boy issues with art by Dan Spiegle and, again, using photo covers. 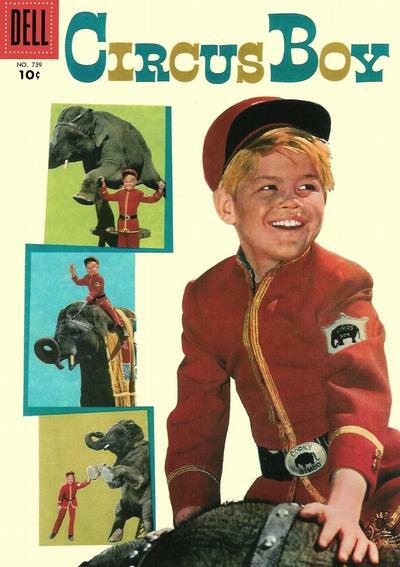 Supposedly, although I haven't been able to track down a copy of this image, the last issue (#813) includes a model of a circus wagon readers can cut out and fold together, along with cutout figures of Corky and Bimbo the Elephant. Which means that there were toys and comics featuring Micky Dolenz's likeness a full ten years before The Monkees became a thing!